The Collected Interior: 7 Easy Design Updates for your Home! 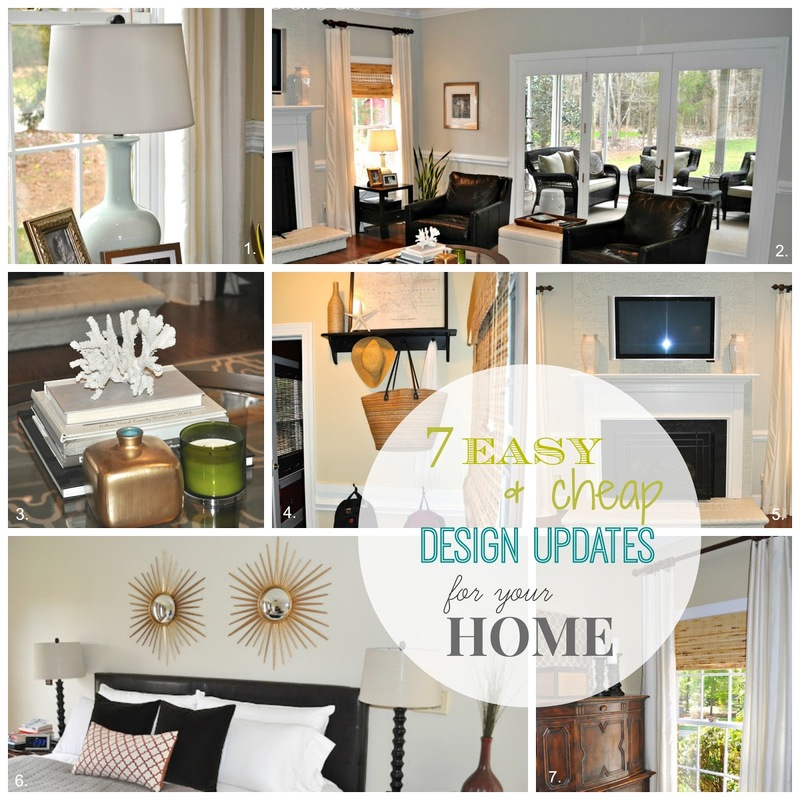 7 Easy Design Updates for your Home! 1. Spray paint a lamp - We recently gave our family room a makeover with a new blue/gray rug and freshly painted gray walls. So my previous turquoise lamp wasn't working with our new color scheme. So instead of buying a new lamp, I spray painted our old one. 2. Create flow between spaces. This pic above shows how our family room flows straight onto our screened porch. I removed the mullions in our french doors, and then decorated the two spaces in similar colors of grays and browns so that they coordinate together. This trick can also help a smaller home feel larger. 3. Stack your coffee table. I love adding accessories to our coffee table! My favorites are simple stacked books with a large hunk of coral or even deer antlers. Then I'll add a small vase and candle. That's it...so easy! 4. Create a space that's both functional and stylish. This is our mini mudroom. And when I say "mini", I mean it's just a wall space that's maybe 3 feet wide with storage and hooks next to our side entry way. It's small alright, but for our two kids it's the perfect spot for coats, book bags, and shoes. 5. If you've got a red brick fireplace, paint it! My traditional husband loved our red brick fireplace for years. Until one day I looked at it and said "it's just so dark and dreary". This was the start of our family room makeover. We've loved it ever since and paint is cheap! Check out our painted brick fireplace (before & After) here. 6. Add trends that are affordable. I love keeping up with interior design trends. But let's face it, trends can go out of style. So I don't want to spend a lot of money. These fun sunburst mirrors are the most affordable ones I've found at around $35 each from, of all places, Home Depot! I love them. And because I didn't spend a lot of money, no big deal if I ever say "oh that's so 2013". 7. Hang your curtains and window panels high! 95 inches is typically the length you'll need. Window treatments that are hung at the top of the window will only visually shorten the height of your ceiling. However hanging them tall, almost to the ceiling, gives the illusion of height! I also use bamboo shades for added privacy and texture. Lowe's has an affordable selection of these. Okay so there it is...my 7 tips and tricks for creating a stylish and updated home on a budget. Happy Decorating! Great tips & I totally agree on painting the brick on a fireplace. Our was horrendous and I painted a bright white and it made such a huge impact. All great tips for spring Jane!